The mobile is a OnePlus 2. The SIM is a Dtac nano-Sim "Dtac Trinet"
The Dtac shop in Big C told me that the phone has roaming enabled but that I should top up "a lot". I understand that I can buy a "Roaming Package", but not sure if I need it - most Internet access will be by Wi-fi. My main need will be for phone calls and SMS's to me from Thailand. Just thinking if you want the phone on for calls from Thailand either you or the caller will hammered on cost for the call. Am pretty sure it will be you if a thai number rings you and you're the one roaming. Thanks for your reply. A friend of mine went to Singapore IIRC and knew he would be downloading a lot of stuff from the internet so he bought a "Roaming Package" for about 1500 baht. When he got back he got a very long bill from Dtac with the total at the bottom of close to a million baht. But at the top it said something like: "To pay: 0 baht"! My main worry is that when I log in to my email in the UK, those clever people at Gmail or Hotmail will block me because i'm not in my usual territory. So they will send me an SMS with an OTP code. If I can't get the phone working, I'll not get the SMS and won't have email access. This worry is pure speculation on my part. I just want to cover all eventualities. No need to top up with much credit. As Chivas has suggested, just turn Data Roaming off, as it is not needed to receive SMS. Either via the Settings on your phone or by tapping in *104*72*9# and then pressing the Dial key. When you arrive back in Thailand; *104*71*9# Dial key to re-enable. I use my DTAC SIM in Canada strictly for receiving of OTP from Kasikorn Bank. I have roaming activated, but never use a roaming package because receiving of an international SMS is free via a local Canadian network. Once I insert the DTAC SIM in Canada, it can take several minutes to lock into a local cell network. Once I activate a banking transaction, it can take several minutes for the SMS to arrive. It has always worked this way. I would never use roaming to receive calls. It will cost you a fortune, as it certainly does in Canada. I have a Toronto local mobile package, oddly enough from 7-11 Canada, that does all the rest. A top-up is good for 365 days. Perfect. I need a phone number that various banks/Email providers know. My mobile is dual-SIM so I could get one for calls to Thailand. Thanks for this. Are you saying that "Roaming" is only about "Data Roaming"? i.e. downloading data from the Internet? Clearly, I'm no expert on this stuff! Excellent information - thanks very much. Let's say there are two kinds of Roaming. GSM(calls and SMS in your case) Roaming and Data Roaming(Internet etc). You need only the first, so disable Data Roaming in the way I have described. I want to do this too on my AIS postpaid sim to pay bills when I'm away. How do you activate it to allow for OTP use without activating sim data generally? Presumably you receive OTP's by SMS (as I do in the case of my AIS prepaid SIM)? If so, Data roaming won't be reactivated automatically as a consequence (assuming that you have already deactivated this). You will, of course, need to ensure that GSM roaming is activated to enable you to receive SMS'd OTP's. Yes, if I pay a bill in Thailand I get an OTP by SMS. However I've purposely never done anything to activate roaming while out of the country. 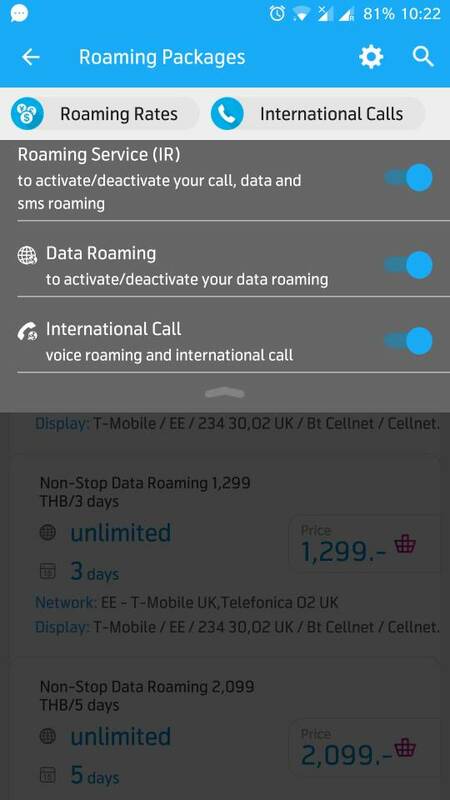 My phone settings only have a single option, to switch on data roaming or not - I don't know what you mean by GSM roaming, or some other roaming option that wouldn't use up data? Would I be able to get around this by enabling international roaming on my phone, but then switching off data the moment I leave the country and use WiFi only, other than for the couple of minutes I need an OTP? Don't AIS have an app you can install to manage your services. I use the Dtac app to enable roaming.